Visible Ink Press : A recent Broadway musical was based on which superhero? A recent Broadway musical was based on which superhero? His interests include chemistry and photography. His character debuted in Amazing Fantasy #15 in 1962. A 2012 movie about him is a "reimagining" of a very similar movie starring Toby Maguire that was released a mere 10 years before the new film. Depending on the version of his story, he was either bitten by a radioactive spider or a genetically altered spider, turning Peter Parker into a web-spinning marvel. Spider-Man is easily the most widely recognized character in Marvel Comics' four-color pantheon, and has been an American pop-culture mainstay for almost five decades. He was a radical departure from the staid conventions of the comic-book superhero of the 1950s--a teenage character that wasn't relegated to sidekick status beside an older, more experienced hero. Creators Stan Lee (editor-scripter) and Steve Ditko (artist-plotter) loosed Spider-Man on an unsuspecting world in 1962, in Amazing Fantasy #15, portraying a scientifically brilliant, but socially maladroit, teen named Peter Parker--a high-school everyman--who receives a fateful bite from a radioactive spider during an atomic science demonstration. Parker consequently finds himself in possession of the proportional abilities of an arachnid, including heightened strength, speed, agility, the ability to cling to walls and ceilings, and a precognitive "spider sense" that alerts him to approaching dangers. Using his inborn scientific talents, Parker synthesizes a unique adhesive "web fluid"--though superstrong it dissolves after an hour's exposure to the open air--and builds a pair of wrist-mounted web-shooters that enable him to shape the webbing into various useful forms. He also designs and sews the web-festooned red-and-blue costume that would quickly become "Spidey's" most visible trademark, and a ubiquitous sight along Manhattan's skyline (hence the immortal and oft-repeated tag-line, "Your friendly neighborhood Spider-Man"). In addition to possessing superpowers atypical for his era--heroes with arthropod-like abilities were relatively uncommon in the early 1960s--Spider-Man also departs from the background typical of other "long-underwear" characters. Instead of hailing from another world like Superman, inheriting millions like Batman, or having the godlike advantages of Wonder Woman, Spider-Man is essentially an ordinary guy, whose alter ego lives a basically normal life, prior to gaining his extraordinary abilities. Co-creator Lee has described him as "an orphan who lived with his aunt and uncle, a bit of a nerd, a loser in the romance department, and who constantly worried about the fact that his family barely had enough money to live on. Except for his superpower, he'd be the quintessential hard-luck kid. He'd have allergy attacks when fighting the villains, he'd be plagued by ingrown toenails, acne, hay fever, and anything else I could dream up." However, Lee's publisher Martin Goodman wasn't initially receptive to the idea of a teen hero taking center stage, nor did he want to accept Spider-Man's neuroses, romantic deficiencies, and chronic concerns about money. Goodman also thought that the audience would be repelled by the character's spider motif. Fortunately, Lee's instincts prevailed; Spider-Man's debut in Amazing Fantasy was an immediate and resounding success. From the beginning, Spider-Man's behavior deviates significantly from the prevailing superheroic norms as well. Instead of selflessly dedicating his superhuman gifts to crime-fighting or the general betterment of humankind, the newly empowered Spider-Man cashes in on his talents by becoming a television celebrity. After his first performance before the cameras, he refuses to bother to stop a robber from stealing the television station's studio box-office receipts. During the days that follow, Spider-Man's fame grows, though Peter Parker wisely keeps his identity concealed. But his world abruptly collapses a few days later when a burglar murders his uncle, Ben Parker, leaving Peter's Aunt May a widow (Ben and May Parker had raised young Peter after the boy's parents, Richard and Mary Parker, died while performing espionage on behalf of the U.S. government). The grief-stricken Spider-Man tracks down Uncle Ben's killer, collaring his first criminal--only to make the horrible discovery that the murderer is the very same robber he'd allowed to escape from the television studio. "My fault," a tearful Peter Parker soliloquies after catching the killer. "All my fault! If only I had stopped him when I could have. But I didn't--and now--Uncle Ben--is dead ..." Spider-Man's debut story closes with a somber narration that permanently sets the series' moral tone: "And a lean, silent figure slowly fades into the gathering darkness, aware at last that in this world, with great power there must also come--great responsibility!" Although Spider-Man's one-shot comics "pilot" in Amazing Fantasy #15 soon led to an ongoing series that began with The Amazing Spider-Man (abbreviated ASM) vol. 1 #1 in March 1963, the eponymous character immediately became integral to the ever-burgeoning "Marvel universe" as well, interacting (and sometimes exchanging blows) with such mainstays as the Fantastic Four, that group's Human Torch (another teen hero), Daredevil, and the Incredible Hulk. Spidey also quickly developed a colorful, soap opera-worthy supporting cast of his own, including: the rabidly anti-vigilante Daily Bugle newspaper publisher J. Jonah Jameson; girlfriend Gwen Stacy (to be replaced later by hipster "party girl" Mary Jane Watson, following Stacy's untimely death); high school jock and bully Flash Thompson, who would later become part of Parker's circle of friends; college roommate Harry Osborn; and a roster of costumed adversaries such as the Chameleon; Mysterio; the Tinkerer; the Vulture; Doctor Octopus; the Sandman; the Lizard, Electro; the Enforcers; the Green Goblin; Kraven the Hunter; the Ringmaster and His Circus of Crime; the Scorpion; the Beetle; Spencer Smythe and the Spider-Slayers; Crime-Master; Molten Man; Master Planner; the Looter (later known as the Meteor Man); and the Kingpin. Like most of the superheroes of his time, Parker took great pains to conceal his secret crime-fighting life from everyone around him; he was largely successful, despite being unmasked on more than one occasion. Stacy's father (NYPD Captain George Stacy) and Watson also figure out his secret on their own, but keep it to themselves. In 2001, even Peter's Aunt May discovers his secret. Parker is beset by chronic personal and financial difficulties from the outset, such as having to earn enough money to pay his ailing Aunt May's medical bills; she had been poised at death's door virtually from the beginning of The Amazing Spider-Man, and even experienced "fake deaths" on two notable occasions. For many years, Peter Parker earned the money he needed to keep his aunt alive by selling photos of himself in action as Spider-Man (taken surreptitiously with an automatic camera, usually webbed to a wall) to his unsuspecting newsprint nemesis, Jameson. But Parker's earnings are barely sufficient to keep body and soul together, let alone properly maintain his Spider-Man costume; on one memorable occasion (Spectacular Spider-Man magazine #1), Parker had to make do with a knock-off Spider-Man uniform borrowed from a costume-shop window; on another (ASM vol. 1 #258, November 1984), he had to wear a paper bag over his head--and a Fantastic Four uniform lent to him by the Human Torch--while waiting for his Spidey suit to dry in a public Laundromat. Despite the myriad mundane problems Parker faces, he generally approaches life--and crime fighting--with an upbeat attitude and a sly sense of humor that often manifests as wisecracks delivered in the midst of battle. As The Amazing Spider-Man developed through the 1960s, the series distinguished itself with a sense of moral ambiguity that the vast majority of its contemporaries lacked; thanks largely to the inflammatory editorials of The Daily Bugle's Jameson, Spider-Man spends many years as a fugitive from the law, though all the while he is attempting to do good in the world. Spidey's reputation isn't helped when he is blamed for the death of George Stacy, who had actually been killed by Dr. Octopus (ASM vol. 1 #90, November 1970). The wall-crawler's first ongoing series is also unusual in that Parker and his supporting cast are not completely frozen in time in the manner of many competing comics. Issue #28 (September 1965) presents Parker's high school graduation. By issue #31 (December 1965) he begins his physics studies at Empire State University, where he meets Gwen Stacy, the first major love of his life, who would later be slain by the first Green Goblin. By issue #185 (October 1978), Parker graduates from college. And in ASM Annual #21 (1987), Parker marries the second great love of his life, Mary Jane Watson. Steve Ditko, the artist who originated Spider-Man's characteristic lean, "spidery" look, left the series with issue #38, after which penciler John Romita took over the illustration chores, adding a dash more realism to the character's still-developing milieu and greatly affecting the look of the rest of the Marvel line as well (Romita eventually became the company's art director). It was Romita who provided the visuals for Spider-Man's climactic battle with the first Green Goblin in 1966, which broke another long-standing superhero taboo--both characters learn one another's secret identities (the Goblin is really Norman Osborn, the industrialist father of Parker's college roommate, Harry). Issues #96-#98 (May-July 1971) broke more new ground by portraying substance abuse by Harry Osborn. Although these three comics (written by Stan Lee and illustrated by Gil Kane) weighed in negatively on illegal drug use, the subject matter was sufficiently ahead of its time to prompt the Comics Code Authority (an industry self-censorship board) to withhold its seal of approval. Many other Spider-Man artists and writers followed in the creative footsteps of Lee, Ditko, and Romita throughout the 1970s, including such scribes as Gerry Conway, Len Wein, and Marv Wolfman, and such illustrators as Gil Kane, Ross Andru, and Keith Pollard. Even prior to this period, Spider-Man was already a fast-expanding franchise, unable to be contained between the covers of a single monthly publication. Not only had the character crossed over into numerous other Marvel titles (this "shared universe" was always one of Marvel's most appealing features), but he spun off briefly into a large-format magazine titled Spectacular Spider-Man, which lasted only two issues (July and November 1968). Spidey's frequent crossovers with other Marvel characters led to a bimonthly title dedicated to this idea, Marvel Team-Up, which began in March 1972 and ran for 150 issues. The debut issue teamed Spider-Man with the Human Torch, and the series eventually paired him with nearly every high-profile character in the Marvel universe (the series was replaced by the Web of Spider-Man monthly series, which started in April 1985; Marvel Team-Up had a second incarnation, an eleven-issue run that began in September 1997). A new monthly series called Spidey Super Stories, intended for younger readers, began publication in October 1974 and lasted for fifty-seven issues. As the 1970s continued, Spider-Man's adventures expanded into a fourth ongoing comic series (a monthly intended for the mainstream Spidey audience) titled Peter Parker: The Spectacular Spider-Man (later shortened to The Spectacular Spider-Man), which debuted in December 1976 and ran for 263 issues. Marvel parodied the character in such series as Not Brand Echh (1967-1969) and Peter Porker, Spider-Ham (a bimonthly that began in May 1985 as part of Marvel's kid-oriented Star Comics line). Spider-Man even left the confines of the Marvel universe itself when he took part in the first crossover between the heroes of Marvel and DC Comics, in the large-format ("treasury-sized") Superman vs. the Amazing Spider-Man (1976), which heralded several more eagerly-anticipated intercompany crossings during the next several years. Although Spider-Man's editorial teams blazed fewer new trails than did either the Lee-Ditko or Lee-Romita pairings, as the hero gained increased exposure during the late 1970s and early 1980s, this era still enjoyed some high-quality stories. Roger Stern's "The Kid Who Collected Spider-Man" (ASM vol. 1 #248, January 1984) is arguably the finest example. In this haunting, poignant tale, Spider-Man reveals his closely guarded secret identity to a young fan. It isn't until the last panel that readers discover the reason for this revelation--it is a gift to a child who is fated very soon to die from a terminal illness. Spider-Man's most significant departure from tradition came more than two decades into his run. ASM vol. 1 #252 (May 1984) garbs Peter Parker in a new, black-and-white costume, which he acquires on a distant planet during the large-scale, multi-hero/multi-villain, twelve-issue Marvel Super Heroes Secret Wars crossover miniseries (May 1984 through April 1985). This living costume, which supplies its own web-fluid and morphs itself into street clothes in response to Parker's thoughts, turns out to have its own evil, manipulative intellect. After Parker realizes that the symbiotic costume is controlling him, rather than vice versa, he discards it; the jilted costume subsequently "possesses" a former newspaper reporter named Eddie Brock. The costume and Brock--whose reputation was smeared after he had falsely accused Spider-Man of being the serial killer known as the Sin-Eater--join forces to settle their respective scores with the wall-crawler, as Venom (ASM vol. 1 #300, May 1988). Venom resembles a supermuscular version of the black-and-white-clad Spider-Man, with the addition of hundreds of razor-sharp teeth and a long, prehensile tongue. This creature subsequently becomes one of Spider-Man's deadliest recurring villains. The title that launched Spider-Man into the 1990s was called, simply enough, Spider-Man, and debuted in August 1990. Spider-Man showcased the writing and illustrations of fan-fave artist and Spawn originator Todd McFarlane, whose eye-grabbing, rococo style drew unprecedented fan attention to the character. Particularly noteworthy are the detailed renderings of "Ditko-esque" poses and the ornately braided "spaghetti webbing" that flows from Spidey's web-shooters. The first issue of Spider-Man also inaugurated Marvel's soon-to-be-ubiquitous practice of releasing a single comic book with multiple covers, a marketing maneuver that arguably appealed more to collector-speculators than to readers. Nevertheless, that issue set a benchmark for sales, pumping more than 3 million copies into direct-market comics shops and newsstand venues around the world, a record that wouldn't be broken until the new X-Men title premiered the following year. November 1992 saw the release of the first issue of Spider-Man 2099, part of a group of titles set in the Marvel universe of the late twenty-first century. This future Spider-Man, whose real name was Miguel O'Hara, received his powers--which included a biologically extruded webbing that anticipated Sam Raimi's cinematic wall-crawler by a full decade--as a result of exposure to genetic-engineering treatments. Spider-Man 2099 was published monthly until August 1996 (issue #46). Spider-Man Unlimited began its quarterly, twenty-three-issue run in May 1993, part of an aggressive Spidey publishing program that lasted throughout the 1990s, even though comics sales in general softened greatly as the decade wore on. Numerous limited series, graphic novels, and reprint collections continued to appear throughout this period. One of the biggest shakeups in Parker's 1990s adventures was a story arc commonly known as "the Clone Saga," which began in the Spidey comics that bore October and November 1994 cover dates. This was intended to reveal that Peter Parker is actually a clone of Spider-Man, made way back in ASM vol. 1 #149 (October 1975) by the Jackal (Miles Warren, one of Parker's college professors), while the real Peter Parker--who had been mistaken for a clone thought killed in an explosion along with the Jackal--returns in the guise of Ben Reilly (a combination of Ben Parker's first name and May Parker's maiden name). (ASM vol. 1 #150 [November 1975] had established that the "Peter Parker" left standing had never definitively learned whether he was the clone or the original.) After Reilly (a.k.a. Parker) returns to New York, the clone Peter Parker decides to leave behind his Spider-Man identity, allowing Reilly to take over as Spider-Man. This controversial development is regarded by many critics as one of the most significant editorial missteps in Spider-Man's checkered history because it was confusing and repudiated two decades of settled continuity. The story arc was finally undone by the later revelation that Reilly was, in fact, not the original Peter Parker; the entire situation had been engineered by Norman Osborn, the original Green Goblin, who was back from the dead (Spider-Man #75, December 1996). Rather than committing wholesale revisionism on the Spidey milieu as the "clone saga" had, Untold Tales of Spider-Man (a twenty-five-issue series, beginning in September 1995) instead embroidered the existing web-slinging legend. Written with obvious respect and affection by acclaimed comics scribe Kurt Busiek, these stories were set very early in Spider-Man's timeline, "between the panels" of the earliest Lee-Ditko stories. Every superheroic icon that endures for several decades is bound to accrete an unwieldy amount of backstory, and Spider-Man is no exception. In Spider-Man: Chapter One (which began in December 1998), writer-artist John Byrne--renowned for his complete rewrite of the history, origin, and powers of DC's Superman a dozen years earlier--updated Spider-Man's origin story, as well as his first year as a spandex-clad crime fighter, to mixed reactions. This revamp was ignored and the original version of the continuity remained canonical. January 1999 saw the start of Peter Parker, Spider-Man, a new ongoing series, as well as the first issue of volume 2 of The Amazing Spider-Man, the revival of Spider-Man's flagship title. Marvel launched its "Ultimate" line of comics, which presents an alternative version of the continuity of its classic characters, with Ultimate Spider-Man, which debuted in October 2000. In this series writer Brian Michael Bendis retells the entire Spidey saga from a beginning moved up to the 2000s. The Amazing Spider-Man vol. 2 #36 (December 2001), written by J. Michael Straczynski (the creator of the Babylon 5 television series), and drawn by John Romita Jr., dealt with Spider-Man's reactions to the September 11, 2001 terrorist attacks on New York's World Trade Center, thereby gaining national media attention. Consistent with his "everyman" viewpoint, Spider-Man sees the non-superpowered police and fire personnel, who risked--and lost--their lives during the catastrophe, as the real heroes of the day. The carnage of September 11 forces Spider-Man to honestly confront the limits of his ability to thwart evil. In the highly controversial "One More Day" storyline (2007), written by J. Michael Straczynski and Joe Quesada and drawn by Quesada, Peter Parker and Mary Jane make a deal with the demon Mephisto in order to save the life of Aunt May, who has been shot. As a result, Mephisto alters history so that Peter and Mary Jane were never married, thus returning Spider-Man to his traditional single status. In other surprises, J. Jonah Jameson became mayor of New York City; and his father, John Jonah Jameson, Sr., married Peter Parker's Aunt May, in Amazing Spider-Man #600 (September 2009). Originally a monthly comic, The Amazing Spider-Man was published three times per month from 2008 to 2010, and, starting in 2011, twice a month. In perhaps the biggest surprise of all, in Ultimate Spider-Man the alternate reality version of Peter Parker was killed off in 2011, opening the way for a new young hero to assume the costumed identity of Spider-Man: the half-black, half-Hispanic Miles Morales. The momentum that Spidey gained in the comics pages was also reflected in Hollywood. Through the 1990s, scripting or getting attached to the "upcoming" Spider-Man film production seemed almost a cottage industry. A pilot script was written for a new ABC TV series by Manny Coto, working for New World (which owned Marvel). On the film front, Terminator and Aliens director James Cameron wrote a treatment and planned to direct the proposed feature. The web became even more tangled as Golan sold pieces of the rights to Viacom, Carolco, and Columbia Tri-Star, and Carolco eventually sold their rights to MGM. In 1993 and 1994, multiple lawsuits were filed by all the companies claiming to own the Spider-Man rights. The battles finally ended in 1999, and on March 1 of that year, Sony Pictures Entertainment and Marvel Enterprises announced a deal to develop Spider-Man for film, television, and merchandise. Work began on a new script, with David Koepp adapting Cameron's treatment, then Scott Rosenberg and Alvin Sargent coming aboard. In 2000, Sam Raimi was announced as the director, with Tobey Maguire as Spider-Man. Willem Dafoe played Norman Osborn, who became the Green Goblin, and Kirsten Dunst depicted girlfriend Mary Jane Watson. Other cast members included James Franco as Norman's son Harry Osborn, Cliff Robertson as Uncle Ben, Rosemary Harris as Aunt May, J. K. Simmons as J. Jonah Jameson, and Elizabeth Banks as Betty Brant. As rumors flew fast and furious on the Internet, the most controversial element of the film was that Spider-Man's webshooters would be organic, with the webbing coming directly from Parker's wrists. By the time of its release on May 3, 2002, Spider-Man was one of the most widely anticipated films of the new millennium. Merchandising was omnipresent, and opening weekend netted over $114 million! The film would eventually top over $400 million in the United States alone. Critics adored the film, and fans did as well, thanks to a pleasant story, good acting, incredible special effects, and a costume that made real Spider-Man's red-and-blue comic book threads. Even as filming for Spider-Man 2 was underway, in July 2003 MTV debuted a new computer-animated Spider-Man series that took its continuity not only from the Spider-Man feature film, but also from 2003's Daredevil movie (with a guest-appearance by the Kingpin). Acclaimed Ultimate Spider-Man comic book writer Brian Michael Bendis took an active part in developing the series, which targeted an older demographic than its animated predecessors. Stars aplenty dropped by to voice characters: Neil Patrick Harris took on the title role, with Lisa Loeb as Mary Jane, while guests included Gina Gershon, Ed Asner, Rob Zombie, Jeffrey Combs, and Michael Clarke Duncan. Only thirteen episodes of the MTV series were produced. Announced to debut on July 2, 2004, Spider-Man 2 saw many returning cast members from the first film, including Maguire, Dunst, Franco, Harris, Simmons, and Banks. New to the cast this time was the pre-Lizard scientist Dr. Curt Connors (played by Dylan Baker), and the mechanically armed villain Dr. Octopus (Alfred Molina). With Sam Raimi back in the director's chair as well, and a script by Koepp, Sargent, Alfred Gough, Miles Millar, and Michael Chabon, the web-slinger again made a multi-million-dollar mark in theaters and in the licensing arena. Sam Raimi also directed what proved to be the last of his trilogy, Spider-Man 3 (2007), in which Maguire, Dunst, Franco, and the other regular cast members returned to their roles. This film had the Sandman, played by Thomas Haden Church, and Venom, portrayed by Topher Grace, as its villains, and belatedly introduced Gwen Stacy, played by Bryce Dallas Howard, and her father Captain Stacy, depicted by James Cromwell. Another new animated TV series, The Spectacular Spider-Man, premiered in 2008. Tremendously successful in movies, Spider-Man had worse luck in the Broadway musical Spider-Man: Turn Off the Dark. Bono and the Edge, the leading members of the rock band U2, wrote the music and lyrics. The show was originally directed by Julie Taymor, who had directed the spectacularly successful Broadway production of Disney's The Lion King. Taymor also collaborated with Glen Berger on the script for the Spider-Man musical. But the show set a record for the number of preview performances without officially opening: 183. 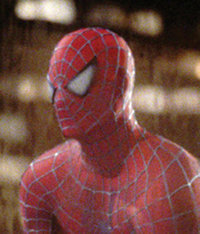 The production, which involved stunts with characters seemingly flying or web-swinging through the air, was plagued by injuries to the performers. Exasperated by the repeated postponements of the official opening, theater critics reviewed the show anyway, and most condemned it. Taymor was forced out, and playwright and Marvel comics writer Roberto Aguirre-Sacasa was brought in to collaborate with Berger on revisions to the script. The musical finally opened in June 2011; the critics' reviews were still mostly negative, but the show, nevertheless, remained popular with audiences. Sam Raimi withdrew from making a fourth Spider-Man film, since he felt he could not meet the release date that Sony Pictures wanted. So instead the next Spider-Man film, The Amazing Spider-Man (2012), has a different director, the appropriately named Marc Webb, and a brand new cast, including Andrew Garfield in the title role, and Emma Stone as Gwen Stacy. The villain is the Lizard, a. k. a. Dr. Curt Connors, played by Rhys Ifans. Other cast members are Martin Sheen as Uncle Ben, Sally Field as Aunt May, and Denis Leary as Captain Stacy. James Vanderbilt, Alvin Sargent, and Steve Kloves worked on the screenplay. Now almost five decades into his existence, Spider-Man is still going strong, both as a storytelling vehicle and as one of the enduring icons of American popular culture. And thanks to the mass exposure achieved by the film franchise, and its many merchandising tie-ins, there is now no dearth of highly motivated Spidey readers. Although today's Spider-Man titles sell at nowhere near the multimillion-copy levels that characterized McFarlane's 1990 Spider-Man premiere, Marvel's friendly neighborhood arachnid, who marked his fiftieth anniversary in 2012, is clearly not about to hang up his webs any time soon.